How Safe is Your Password? | Should I Change My Password? Should I Change My Password is a free service brought to you from Avalanche Technology Group. Should I Change My Password allows you to check anonymously if your email addresses have been compromised. Till date they claim to have identified more than 10 million compromised email addresses. It works by combing the internet to find email and password data sets that have been hacked, leaked or compromised. The data is then aggregated so that you can check whether your password has been included in any of these security breaches. To check whether your email address has been compromised or not – go to Should I Change My Password and type in your email address and click “Check It”. Result will be returned soon. If the result is something like this – you can feel comfortable. Even if your email comes back clean, it does not that mean your passwords weren’t stolen. Unfortunately it only means that they weren’t stolen and published as part of any of the breaches listed here. 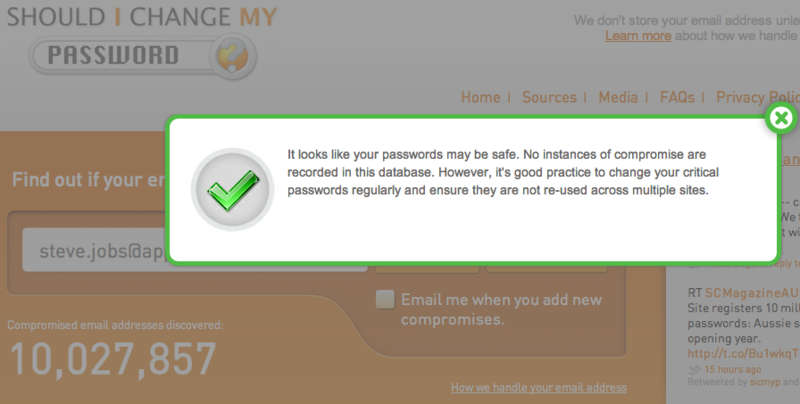 If you don’t already do so, it’s good practice to change passwords regularly just in case.